Do you ever wake up in the mood for something sweet and satisfying, but not wanting to make the effort to get over to your local bakery? Well this is the result of one of those mornings. I had not planned anything specific and decided to open up my recent magazine arrivals for inspiration. 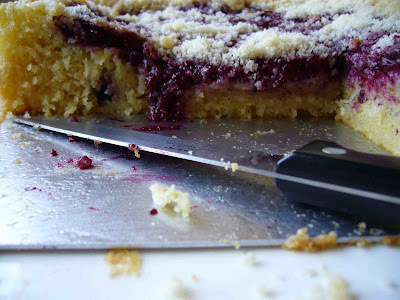 I found my answer in a blueberry coffee cake recipe. After a glance around the kitchen and deciding that swapping out some St. Andre triple cream french cheese for the cream cheese would be an experiment worth undertaking, I decided I had enough to make something similar using the recipe as my guideline. Place the berries and 1 T sugar in a medium saucepan and set over medium heat. When warmed through, add 2 T flour and let reduce down. Once thickened slightly, remove the mixture from heat and allow to cool. Add the remaining 2 cups flour and 3/4 cup of sugar to a food processor and pulse to mix. Cut the butter into thin slices and add to the processor. Pulse until just incorporated. Reserving a 1/2 cup, pour remaining mixture into a medium bowl and add baking soda, baking powder, salt and lemon zest. In another bowl, whisk together the yogurt, sour cream, vanilla and 1 egg. Use a spatula to mix the wet ingredients into the dry without over mixing. Pour batter into a 9-inch cake pan. Add the cheese, lemon juice, 1/4 cup of sugar and remaining egg to the food processor. Run the processor until the mixture is completely smooth. Spread this over the batter, leaving a border. Take the cooled berry mixture and spread over the same area of batter. Sprinkle the reserved 1/2 cup of the flour mixture over the entire cake and bake for 40 minutes until puffy and golden on the edges. Let cool before serving and enjoy! Oooooo...blueberries!! Any blueberries that I've had this year I've had to sneak to eat them. They are my boyfriend's favorite fruit, but he isn't allowed to have them. So I'll just have to look at your coffee cake and dream of blueberries. :-) Thanks so much for stopping by my blog! Looks delicious! I really love coffee cake. There is just something about that wonderful crumbly topping. I love blueberries. I've been making blueberry muffins and thanks to another foodie blogroll member, blueberry waffles. 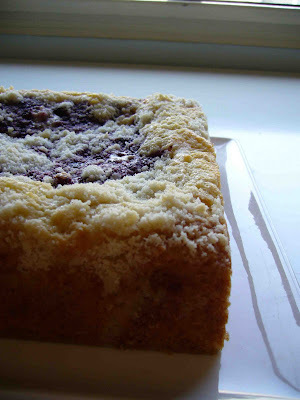 Now I can make Blueberry Coffee Cake. Thanks for the great recipe. Wow this looks seriously delish!